Has Denon one-upped Sonos? This well-connected and powerful 4K-ready 3.0 soundbar can has wireless 5.1 home cinema and multi-room options if used with Denon’s HEOS speakers. Its subwoofer is more affordable than its rival's, but the HEOS Bar impresses all on its own, delivering muscular music and movie soundtracks. However, its angular styling and large footprint won't suit everyone. We hate to break it to you, but your TV sounds terrible. The likes of Samsung, LG and Sony will never admit it, but everyone knows that sound quality was sacrificed almost entirely in the pursuit of the ever-flatter TV. 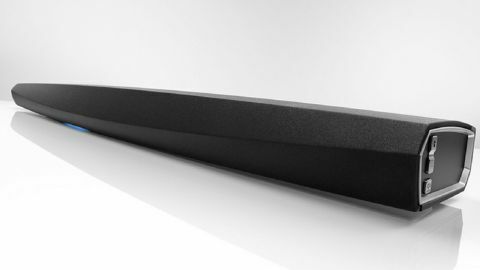 Cue the HEOS Bar (a brand 'by Denon'), a meaty and musical 1.1m-long soundbar designed not only to bring back some bass to your binge-watching, but also the possibility of multi-room. And while that might make you feel like the $480 / £569 / AU$1300 Denon Heos sounds a bit too similar to the Sonos Playbar, Denon's stab at multi-room differs in two main ways. Firstly, it uses HDMI, and secondly, it sounds awesome. The HEOS Bar is designed to be paired with 50- to 55-inch TVs. Measuring 72x1100x148 mm and weighing 4.8kg, one end contains a few welcome hard-buttons (such as a volume rocker and an off switch), while an opening on the back sports four HDMI inputs and one output. These multiple HDMI ports are important as they enable the soundbar to act like a HDMI switching hub, so you can attach all of your sources (such as a set-top box or games console) to the HEOS Bar. What's more all of those HDMIs are 2.0a, so can switch 4K HDR and Dolby Vision sources. Is Denon going after the home cinema aficionado? It seems so, because the HEOS Bar also deals in Dolby TrueHD (but not Dolby Atmos) and DTS-HD Master Audio. That said, if you need them, there are also optical and coaxial audio jacks on board. However, just as important is its ability to fetch from streaming music platforms. The presence of Spotify is a given, but the HEOS also fetches all formats around (including lossless audio formats like FLAC and WAV in quality up to 24-bits/192kHz) from Deezer, Amazon Music, Tidal, Soundcloud, Napster, and web radio via TuneIn. What joins the whole concept together is the HEOS app, which handles logins to streaming sites and can control what music is played (and in which room, if you have more HEOS gear). For those wanting to attach retro gadgets, the HEOS Bar also has a 3.5mm jack, and a USB slot for inserting a USB stick (which it can play music from). However, once the HEOS Bar has been set-up, both of them are way too difficult to reach to be of any use. Rather cleverly the HEOS Bar has been designed so it can be mounted either beneath a wall-mounted TV, or in front of one perched on a table while looking absolutely fine in both positions (despite it being kinda upside-down when on a table). Using a couple of clips in the box you can raise it just above the surface, though that could overlap a TV's screen. Once in position, setting up its all-important networking dimension is either a wired or a wireless affair. Since it was right next to a router in our home, we wired it in. After it has a connection to the internet, the HEOS Bar is all about HDMI, which does make it seem a much more serious product than the PlayBar. After you've placed it in front of a TV, run a HDMI cable from the back of the HEOS Bar to an Audio Return Channel-compatible (ARC) HDMI slot on your TV. Job done. Although a small palm-sized remote is supplied, it's the HEOS app that proves an integral part of making this soundbar so enjoyable to use. As well as streamlining the initial setup, and serving as a hub to enter various passwords for Spotify etc. via a mandatory HEOS account (does anyone want yet another random online account? ), the app allows the phone to act as the volume control. Whether you're watching TV and using your phone, or listening to music and choosing which track to play next, controlling the sound with the volume buttons on a phone feels very natural. That app includes some basic tweaks to the sound settings (just bass and treble) and also controls what music plays in which zone, if you have other HEOS gear attached. However, what we liked most about the app was the attention to detail. Not only does it allow the renaming of your speaker, but the title of the current song becomes an integral part of the app's interface. That's slick. Though, admittedly, most people will use it in this basic as-it-comes 3.0 design so that's what we tested it as. Although it also reaches incredible volumes, it's actually at its best if you sit close, because only then do you get to hear the placement of individual instruments in the mix. That's largely because staying close get impressive width from stereo music, though it's almost as good with a film soundtrack when sat further away. In a few days of normal usage, we listened to a lot more music than we normally would – always a good sign – and found the most useful sound mode to be the dialogue enhancer, which gives three options for giving speech more clarity. It was really useful when watching TV, and some films. We had no complaints about bass for most of what I watched, but high-octane films do sound a little flat. So know that a wireless HEOS Sub subwoofer is also available, which creates a 3.1 system. Or, if you're fixed on creating a 'proper' 5.1 home cinema, you can also add a couple of HEOS 1 HS2 rear speakers. As someone who's always thought the Sonos PlayBar was overrated in terms of sound quality, the HEOS Bar proved something of a revelation. As any modern home entertainment should, of course, and yet the HEOS Bar does lack a few niceties: The app is impressive, but it doesn't present many opportunities to tweak the sound settings. We also got rather annoyed that the USB slot is buried at the back with the other ins and outs, and was was a pain to use (it would go great on the right-hand side next to the volume buttons). Those small gripes aside, the HEOS Bar is a high quality home entertainment nerve center sporting decent looks. It's easy to use, and boasts plenty of musical ability. In terms of the fairly low quality soundbar market, it's got few competitors.